During my stay in Hinwil I was kindly whisked away by Sabine for a day out, completely unaware of where I would be going. 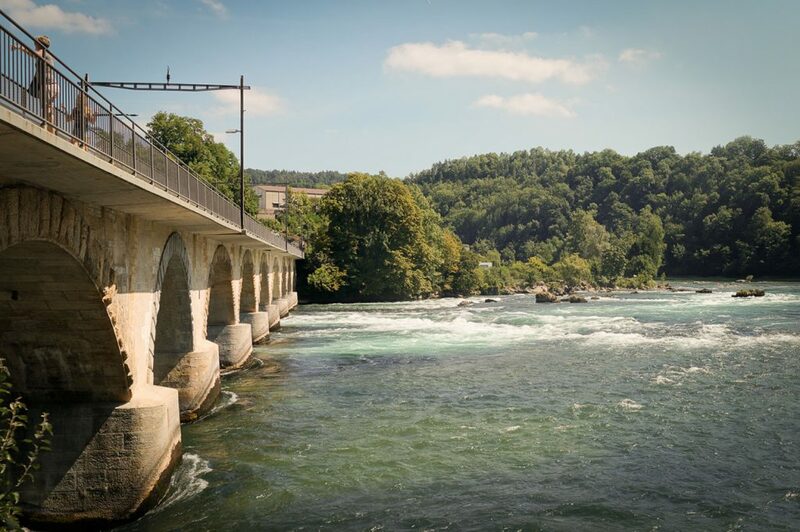 As it turns out, and as I’m sure you’ll have figured from the title, it was a trip to the Rheinfall. 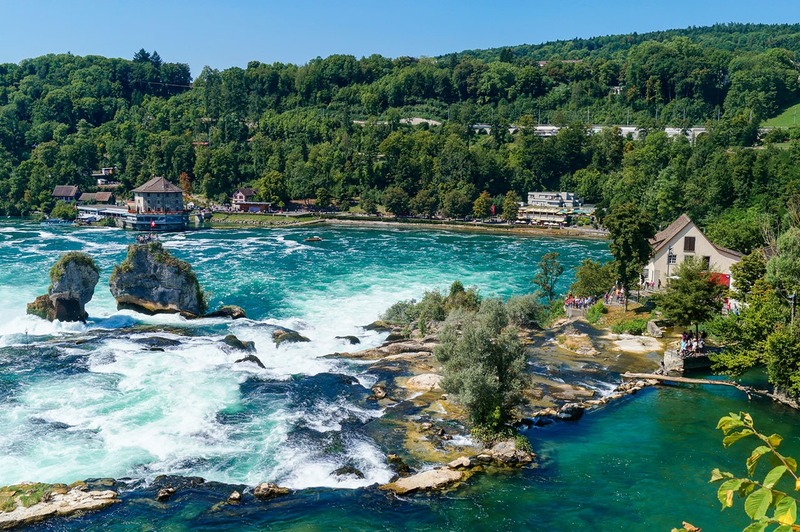 For those of you that don’t know, the Rhine Falls make up the largest waterfall in not just Switzerland, but the whole of Europe. It doesn’t seem like much when you consider they’re around 23 metres high, but the waterfalls are wide and the amount of water flowing through is enormous. Which makes for a lot of spray, all the better on a hot day.Having parked up, we set about our trek around the falls. You can walk a complete loop around if you have time, though there are quite a few steps, and you’ll need to use a few bridges. If walking isn’t your thing, you can always get on board one of the boats and get up close and personal to the falls that way instead. There are even different types of boat trips – such as a trip to the rock, or a leisurely cruise around the basin. There’s something for everyone. In fact, in the picture above you can see the whole lot – the steps, the boats, the spray and even Laufen castle.If you choose to walk around, like I did, you’ll be able to find a few decent look out spots from which you can take some stunning photographs. You should probably consider the time of day you’re heading there though, the sun can make some snaps (such as the one above) a bit too bright. Which unfortunately, doesn’t really do it justice. There are much better pictures of the falls and the castle around on the internet, they’re worth a look.Anyhow, starting from the top you’ll be wanting the cross the old stone bridge. I feel for the poor fellows that had to build it, though I’m sure they had a pretty picturesque work site for a while. There are two things about crossing the bridge that I loved. One of them being that it meant I was no longer facing the sun – brilliant, now I can take some photos! But more importantly, this is the view. Clean, turquoise water, to a backdrop of a green forest and a clear blue sky. What isn’t to love? 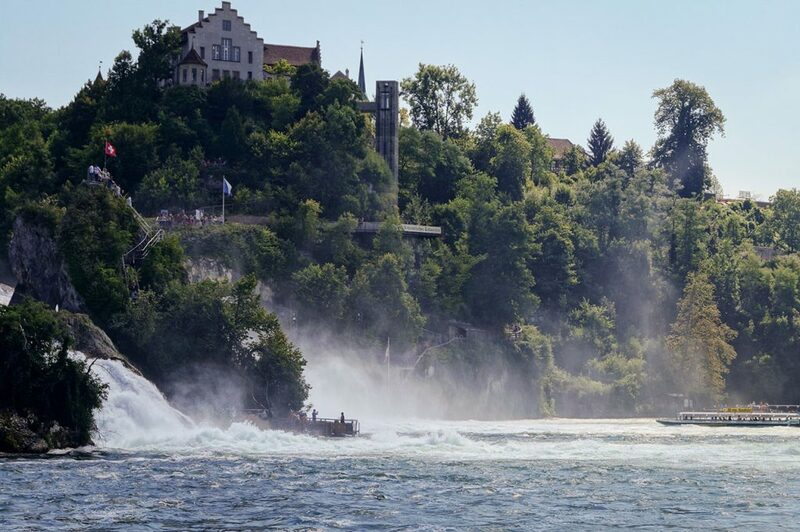 You get sight of the infamous rock in the middle of the falls, as well as the visitor centre, the boats in the basin and all of the tiny people walking around the outskirts. Now for potentially my favourite part – the waterwheel house. If you think about it, it only makes sense that a waterfall would have been used to provide power, and the mills on the Rhine Falls are no exception. 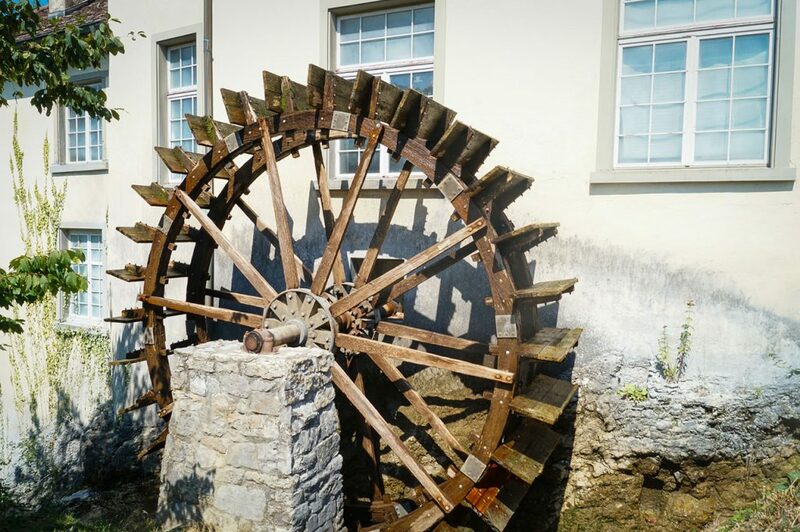 Today, many of the mills have been removed, but this beauty is still standing, having had some restoration work.The best part though, is that it also doubles as a cafe. Having spent what seems like an eternity burning up in the sun, and taking in the views or climbing vast staircases, it provides some much needed respite. This place has everything you need for an amazing day out. What else is there to say? Without giving you the wiki-versions of everything or spoiling the fun, I’d really recommend giving yourself a day to take everything in if you ever find yourself nearby. Switzerland has plenty of offer, and in my few short days there this was one of my highlights.